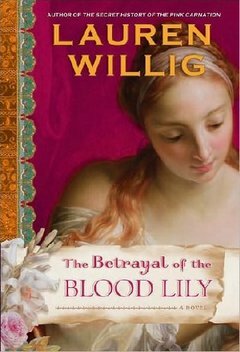 You don’t need to read the prequels to this installment of Lauren Willig’s Pink Carnation series of espionage-laden historical romances for the story to make sense. Newcomers and loyal fans alike will love brash, flirtatious Penelope’s exotic adventure in Hyderabad, India, told in Lauren Willig’s signature mix of historical richness and whimsical humor. In an unusual setup for a period romance, Penelope starts her adventure as a married woman. Her feckless, gambler husband, Freddy, is endearing but clearly not a love match. It takes dashing Capt. Reid to heat things up to a heady mix of banter and taboo chemistry. Working with the social constraints of class and conventions about marriage, Willig does smart, historically sound plotting that develops both Penelope and Capt. Reid into nuanced, honest characters, facing questions about honor. And of course, there’s plenty of intrigue, from legendary treasure to betrayed love to a secretive spy who may threaten everything from British diplomacy to Penelope’s life. John Bowe, co-editor of “Gig: Americans Talk About Their Jobs” (Three Rivers Press, 2001), presents an amazing array of stories about first love, heartbreak, arguments and romance. Organizing the book into sections based on the length of the relationship makes sense on an intuitive level, if not in sequence. (Reading about a drug addict’s tempestuous love for a violent ex, right after a devout Christian’s Scripture-laden marriage proposal, for instance, was particularly jarring.) But the variety of stories collected makes browsing absorbing and fun. Each story is candid and raw. Sometimes a little too raw. Written almost verbatim, trains of thought wander and meander, sometimes making individual narratives confusing and hard to track. Love that lasts over several decades tells a very different story about a couple than a teenage crush. Before reading this eclectic and upbeat guide to romance as a spiritual journey, it helps to have more in-depth knowledge of astrology and New Age thought than just reading your horoscope in the paper. Astrological counselor Jessica Shepherd constructs her advice on finding your one true soul mate from her wide-ranging knowledge base, presenting concepts like mantras, chakra meditation and divine intention in her discussion. A New Age neophyte might be baffled by some of her more enthusiastic discussions of Venus energy, or the karmic mate versus the soul mate. Still, whatever you think about star charts or magic spells, a lot of Shepherd’s advice is sound. Staying positive, being good and nurturing to yourself, and making sure your heart is healed from whatever sabotage or grief it suffered in the past seems like a good place to start when you’re looking for love, whether it’s your magical soul mate or not. While intensely romantic, this story of love at first sight is not particularly happy. Excerpts from forensic textbooks about crime and murder investigation weave an element of foreboding through this tale, so much so that the threat of danger feels like a third character. Separately, Nora and Timothy are miserable. Nora languishes in a small town, caring for her emotionally manipulative, dying mother. Timothy manages a stock portfolio of his family’s millions, constantly harangued by his caustic mother. In alternating chapters, each imposes a heavy burden of doubts and family guilt on the reader, while being cagey and stand-offish with each other. Knowing each character’s mind-set so completely means the reader knows (or can guess) significantly more than the two cautious lovers. Their love story meanders, jolted occasionally by a sense of urgency from interjecting clinical yet grisly passages about murder. Like a muted version of Romeo and Juliet, their romance feels inevitably doomed — the suspense coming from not if, but how, tragedy will strike. Drawing on theories from Darwin to Adam Smith to modern marketing, Andrew Trees promises to debunk what he calls the “romantic storyline” of effortless true love and love at first sight. He draws on studies of evolutionary biology, economics and consumer behavior to underline the choices and assumptions people make about love. It’s like reading Malcolm Gladwell’s version of a dating advice column. Some of what he finds is surprising. The stereotype that gentlemen prefer blondes could be tied to evolutionary drives to find a fertile, youthful woman. Too many choices can be not just overwhelming but also paralyzing, Trees advises, comparing looking for one true love to a study of consumers deciding between brands of jam. Game theory, mathematics and evolution are innovative ways to discuss the search for a date. Even while juggling diverse disciplines, Trees keeps his prose conversational, explaining complex theories with lively humor. The result is fun, fact-packed pop science.